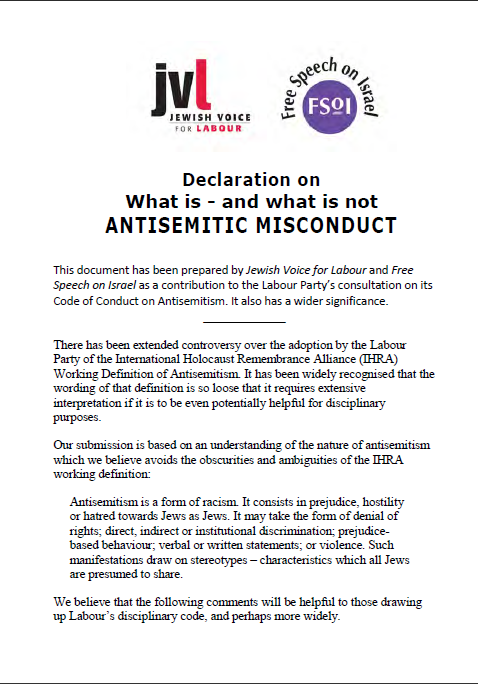 This declaration has been prepared by Jewish Voice for Labour and Free Speech on Israel as a contribution to the Labour Party’s consultation on its Code of Conduct on Antisemitism. It also has a wider significance. There has been extended controversy over the adoption by the Labour Party of the International Holocaust Remembrance Alliance (IHRA) Working Definition of Antisemitism. It has been widely recognised that the wording of that definition is so loose that it requires extensive interpretation if it is to be even potentially helpful for disciplinary purposes.